Fudgy, crackled, powder-sugar coated chocolate cookies topped off with milk chocolate kisses! 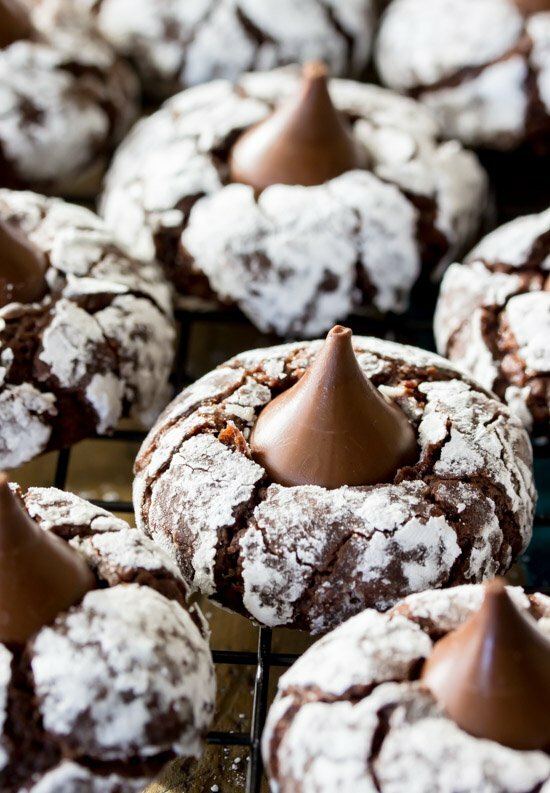 These Chocolate kiss cookies are chocolate overload (in the best possible way!) and would make a great addition to your holiday cookie tray!! Hello again! Sam here from Sugar Spun Run with another sweet recipe for you today: Chocolate Kiss Cookies! After making so many batches of peanut butter blossoms earlier this month, I knew that I wanted a more intense chocolate version of these classic cookies, and so chocolate kiss cookies were born! These cookies are perfect anytime of the year, but they would also be a great addition to your holiday Christmas tray; I know that I’ll be serving them alongside some of my all-time favorites (like these chocolate chip shortbread cookies and my oatmeal cookies). My husband took a batch of these into work to share with his co-workers, and he said he couldn’t believe how many compliments they got for how soft, fudgy, and just all around delicious they are. 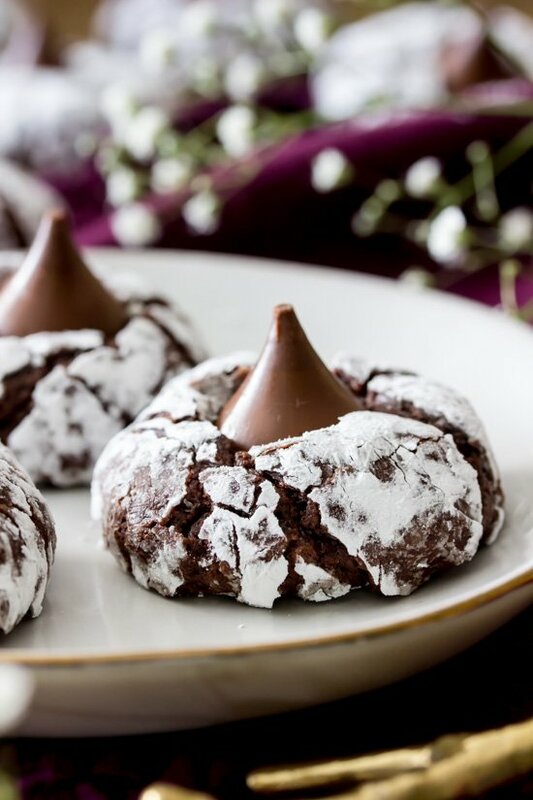 The bases for these chocolate kiss cookies were inspired by classic chocolate crinkle cookies. I definitely recommend rolling them in powdered sugar, but you can also play with other options — in the past I’ve also rolled the cookie dough in granulated sugar and in colored nonpareils (gives them a great texture!). This recipe does require some chilling, as the chocolate cookie dough will be too sticky to roll in your hands right away. Once the dough has chilled, you’ll roll the cookie dough through powdered sugar until it’s completely covered. I recommend baking these cookies so that they’re still just slightly under-done when you pull them out of the oven. 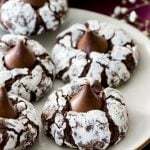 I’ve found that one of the worst things that you can do with these chocolate kiss cookies is over-bake them, as the centers will come out too dry. If the centers are still a bit under-done, though, they can finish baking on the cookie sheet while they cool, and the cookies will stay nice and soft and fudgy. I just used classic milk chocolate kisses to top off these chocolate kiss cookies, but you can definitely play with different flavors as well. Dark chocolate, peppermint, and white chocolate would all be great options! Combine the butter and sugar in the bowl of a stand mixer (or in a large bowl, and use an electric mixer) and beat together until ingredients are well-creamed. Add eggs, one at a time, stirring until completely combined, and then stir in vanilla extract. In a separate bowl, whisk together the flour, cocoa powder, baking powder, and salt. Gradually add dry ingredients to your wet ingredients until completely combined. After chilling, preheat oven to 350F and prepare baking sheet by lining with parchment paper. Roll dough into 1 1/2 Tablespoon-sized balls and roll thoroughly in powdered sugar. Transfer to baking sheet and bake on 350F for 10-12 minutes -- take care to not over-bake. Within 1-2 minutes of removing cookies from oven, gently press a chocolate kiss into the center of each cookie. Allow cookies to finish cooling completely on baking sheet before enjoying. Amazing cookies !! Made them for our cookie exchange this year and everyone loved them !!! Thank you for the recipie. Is it OK to chill dough for a couple days? I just did this and they turned out beautifully. So yes, totally ok! I made these delicious cookies with a twist. Used 1 tablespoon vanilla and 1 tablespoon peppermint extract. Topped it with Herhey’s candycane Kisses. Was the hit of the Christmas party! This is my favorite cookie today. I made them today and they tasted GREAT! Thank you for the awesome recipe. Hey Rachel I love this recipe. Would love to try it. Your video says use salted butter while the recipe says unsalted butter. What should I use? I made them according to the printed recipe which called for unsalted butter. They were tasteless except for the Hershey kiss on top. Video however called for salted butter and they are delicious. So I put the kisses on and they melted. Which is to be expected, I know. But mine melted so much you couldn’t even tell they were kisses. What did I do wrong? Did you return them to the oven by chance? I place my kisses on the cookies directly after removing from the oven and I’ve never had them melt all the way. The cookie tray should be placed on a cooling rack and then just add your kisses on top. Try puttingthe unwrapped candies in the fridge. I did that and had no problem with them melting, they melted just enough to add to the gooey center. I had this problem with the white chocolate kisses so I freeze them and then put them on the cookies. I can hardly wait to bake these beauties!! They will look so nice with the other cookies that I will be using for my holiday cookie trays. I just love your recipes!!! Does this really use a “cup” of cocoa? Seems like a lot of cocoa. Yes, they should freeze nicely. Has anyone tried making these with almond or coconut flour? Probably my new favorite cookie!!!!!! I made these for a Kid’s Hope party and everyone loved them! I used cherry cordial Hershey Kisses instead of solid milk chocolate Kisses and they worked great!